India’s economic development is highly dependent on its water supply. Although only 8% of the country’s total freshwater withdrawal is used for industrial purposes, the demand will grow significantly in the coming years. The water requirement for industrial use will quadruple from the current 30 billion cubic metres (bcm) to 120 bcm by 2025, according to the World Bank. Better water management will therefore become a crucial success factor for firms in the long run. It also will help firms to manage the rising cost of water. Furthermore, India’s most productive industrial zones are located in water-stressed regions around megacities such as Mumbai and Delhi. Hence, industry-related water pollution, e.g. on groundwater, affects millions of people and jeopardizes the cities survivability. The (water) wheel has not to be reinvented—it needs to be scaled. Many industries have had to adopt water-recycling systems because of scarcity of water. Large Indian firms such as Maruti Suzuki India Ltd have successfully proved the financial feasibility of water-efficiency measures as part of their business processes. 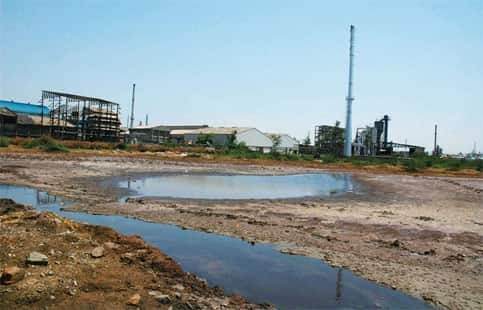 International companies, for example the German rubber producer Lanxess AG has invested in the latest waste water treatment technology in the construction of its new site in Jhagadia, Gujarat. The companies seemed to have realized that to deliver on their aggressive growth plans, they need to do more with less water. “In many markets, we will see dramatic changes in the forthcoming years," says Jürgen C. Binzer, vice-president, Business Development, at Hollingsworth and Vose Co., a global filtration and separation materials company. “In the future, we will not only discuss prices with our customers that much any longer—we will discuss availability. And what becomes necessary for products made from whatever natural resource, is already due for water for quite a while. Water is a critical resource and will even become a more critical one in the future." Hollingsworth and Vose announced the formation of a joint venture with India’s Nath Group in February. The joint venture plans to establish a manufacturing capability including the construction of a new speciality paper mill near Aurangabad, Maharashtra. Furthermore, vast potential lies in improving the water footprint of small- and medium-sized companies, particularly from water-intensive industries. According to a study by CERNA, 40% of the waste water generated by the most polluting Indian industries comes from small-sized industries. Their pollution puts the Indian regulators in front of a difficult arbitrage between economic development and environmental sustainability, as they simply cannot afford the investment for the necessary green transformation through, for example, new technology. However, small industries are often ignored in discussions on sustainability in India despite their significance to the economy. In Delhi, for example, the Industrial Policy Report 2010-2121 shows that the city has close to 100,000 manufacturing units employing nearly 600,000 people, 450,000 of whom are working in the unorganized sector. Hence, the majority of industries around Delhi are of the unskilled nature. To prevent further labour-related migration and reduce the stress on the city’s existing water scarcity, the report clearly emphasizes on the need for a more resource-efficient industry to reduce the impact on the urban environment. With regards to water, a clear road map is missing. It merely points out that “in order to save water, the option of installing dual piping systems, where waste water can be recycled, in industrial areas may be explored". But there is hope that the upcoming Delhi Water Plan 2021, drafted by the Japan International Cooperation Agency for improvement of the water supply system, adapts more concrete guidelines. Indian industries simply cannot afford to avoid dealing with industrial water pollution. My work with Bridge to India, a consulting company working in the fields of renewable energy, resource management and urban planning based in Delhi, showed that there is a growing realization among the industry for the need of efficient water management. Large companies understand the necessity to incorporate the sustainable usage of resources in their core business model. Funding, a long-term perspective and technical expertise is generally available in the large industrial sector. The bottleneck, especially in the urban context, is the transformation of small- and medium-sized companies from water-intensive sectors. So far, these firms still have access to groundwater, mostly without using waste water treatment processes. Converting their business practice in order to reduce their dependency on groundwater through technology requires new financing schemes, strong regulatory bodies and policies. However, international technology providers benefit from the vast development of the market. Their success in winning large projects depends on aggressive pricing, project execution skills and the ability to engineer processes. This trend is likely to strengthen in the next years as competition will increase. As part of India’s economic growth story, the rising demand of water because of the overall increase in productivity has to be managed carefully by all stakeholders. Therefore, urban industrial water reusage remains an important factor for the country’s overall sustainable development. Isabelle-Jasmin Roth is director at Bridge to India, a consulting company working in the fields of renewable energy, resource management and urban planning based in Delhi.